In the life of a freelancer, free time is a luxury! Yes, the rumor has it that freelancers choose their timetable, pick the clients, in fact they are quite free to do whatever they like, as the word freelance would indicate. WRONG! It is a mere legend. Freelancers invest endless hours and make an enormous effort to get the next business leads, to keep up with their marketing and networking activities, to issue invoices and try to fit some work in the meantime. So, in fact, they do not really get a lot of spare time in their hands. The less spare time one has the more valuable it is. Take me, for instance. I am online nearly the whole day and sometimes till late at night. And so, when I decide to move away from my desk and join the real world, I like to see my beloved friends, go to restaurants, go to a beach, have coffee in cafes, watch a movie in a cinema and simple be normal. I find it hard to deal with what I call, the Translator Curse! A Translator in Restaurants: Menus! In the island of Crete, where I live and work, every year millions of tourists, visitors from different parts of the world arrive to enjoy the sunshine, the sea and spend their well-earned annual holiday. It is to restaurateurs and shop owners interest to have their menus and marketing documentation translated into different languages. The more languages they have them translated into, the more customers will be attracted by them. It is in my nature to flick through the menus out of interest. Typos, mistranslations and unsuccessful cultural transfers set my red-light alarm off. Most of the times, I am driven back to the original text, to be sure I will order the right dish! And sometimes, I spot most of the above in the original text as well. A Translator at a Beach: Signs! Not to and from a beach, but little signs that hang outside toilets and changing rooms. 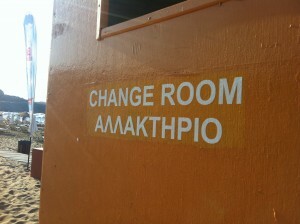 In a beach nearby, I spotted this sign (see pic): the majestic Αλλακτήριο and its English translation change room. CURSED! I did not know where to begin: the source or the target text. I looked Αλλακτήριο up in all the hard pack dictionaries I own and all the online ones I am aware of and unfortunately I could not find such a word anywhere. I drew the conclusion that Αλλακτήριο is a made up word for Αποδυτήρια. By the way, wherever Αλλακτήριο is mentioned in this paragraph, it is underlined with a red line by Word, so there must be a spelling error somewhere, but then again it is a made-up word! After solving the mystery of the source text, I moved on to the target. This was easier to guess: a changing room or (changeroom -regional use). I decided that this sign would put a smile on Greeks’ and English native speakers’ face alike! A Translator in the Movies: Subtitles! As a movie-buff, I cannot wait till some movies I have set my eyes on come to screens nearby. I buy my ticket, I get my pop-corn and my refreshment and I am ready to go! Lights fade, trailers start, trailers finish, and the movie begins! All nice and comfy, I decide to follow the subtitles (all non-Greek movies are subtitled). CURSED! By experience, I am well aware that subtitlers do not have the freedom fit all the spoken words in the subtitles, the characters’ number is limited, I give them that. But please, please if any of you are reading this post, where there is a case when you do not understand what the actor/actress says, do not just make up a sentence that fits the screen-play of the particular scene. Rewind, replay it as many times as it is needed until it is clear, or try asking a native speaker or even your client. It takes one subtitle to ruin a perfect scene. Have you ever experienced difficulty in switching the translator’s mode on and off when you leave your office or your home office to join the real world? Should translators go out more and maybe they will used to ignore all the little errors that go around? Please, do share your thoughts! Thank you very much for sharing that! It is fascinating to me that a lot of translators live their lives through their job! I guess, it happens to other professions as well, it is just that languages are .. everywhere! Thanks again for you comment and have a fruitful week! Hi there there! This publish couldn’t be published any much better! Looking at via this article reminds me of my prior area mate! He usually stored speaking about this. I’ll ahead this short article to him. Quite confident he’ll possess a great go through. Thanks for sharing! Thank you for your comment! I am glad you have found it of interest! Feel free to forward it to anyone you think will enjoy it! Your observations are so truthful. Concerning other professions, my sister, for example, who is a would-be fashion designer can’t buy clothes at shops as she always finds some problems with tailoring. So many specialists have their own “curses”. Thank you for your comment! I do agree with you that all specialists have their own “curses”. I do look back when I was just a translation student, still unaware of the world around me… I never seemed to notice such things.. I guess it happens when one occupes oneself with a single task, then the whole world becomes this task! I’d need to look at with you right here. That’s not something I typically do! I get satisfaction in reading through a submit that will make people assume. In addition, many thanks for permitting me to comment! Thank you for reading the post! I hope you enjoyed it! I would like to thnkx for your efforts you’ve set in creating this web site. I’m hoping the same high-grade website submit from you in the upcoming as well. In fact your creative producing abilities has inspired me to acquire my own web site now. Actually the running a blog is spreading its wings quickly. Your write up is actually a excellent example of it. Thank you so much for your kind words! Gosh, it has inspired you to make your own! That is great!! what is your address? I wish you all the luck with it! Thank you for your post! Please feel free to link/bookmark the site!